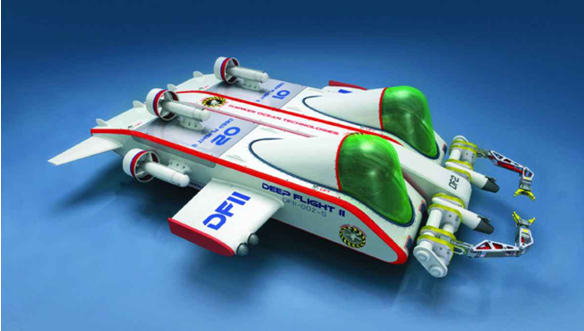 The Deep Flight II sub uses stubby wings that propel it down like an airplane goes up. By liberal estimates, weve explored about 5 percent of the seas, and nearly all of that in the first 1,000 feet. Thats the familiar blue part, penetrated by sunlight, home to the colorful reefs and just about every fish youve ever seen. Beyond that is the deep—a pitch-black region that stretches down to roughly 35,800 feet, the bottom of the Marianas Trench. Nearly all the major oceanographic finds made in that region—hydrothermal vents and the rare life-forms that thrive in the extreme temperatures there, sponges that can treat tumors, thousands of new species, the Titanic—have occurred above 15,000 feet, the lower limit of the worlds handful of manned submersibles for most of the past 50 years. 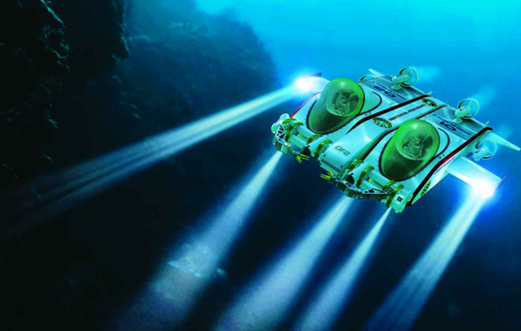 Now engineers want to unlock the rest of the sea with a new fleet of manned submersibles. And they dont have to go to the very bottom to do it. In fact, only about 2 percent of the seafloor lies below 20,000 feet, in deep, muddy trenches. If we extend our current reach just 5,000 feet—another mile—it will open about 98 percent of the worlds oceans to scientific eyes. The payoffs could be huge. Mining companies hope to search hydrothermal vents for minerals like nickel; gas and oil companies are eager to explore the seafloor for new energy sources; and marine biologists want to study how climate change has affected deep ecosystems. In addition, theres simple curiosity of the man-versus-nature sort. With all the worlds highest peaks summited and both poles trampled, the deep seas are a ripe frontier. But sending a vehicle that deep requires serious cash and engineering. The craft must be small enough to move on battery power and sturdy enough to withstand immense pressure—10,340 pounds of water per square inch at 23,000 feet, equivalent to having a school bus on your head. 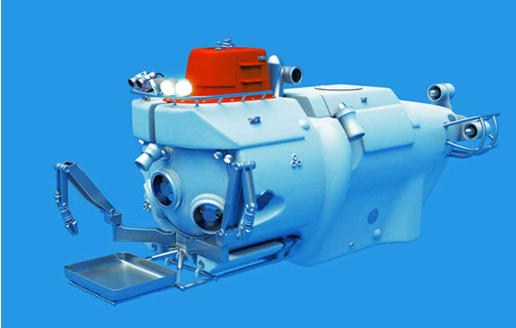 A manned submersible has to meet even higher standards: It must keep its occupants alive. In 1960, American naval lieutenant Don Walsh and Swiss engineer Jacques Piccard made the only expedition to the worlds deepest point, piloting a 50-foot, submarine-like vehicle called the Bathyscaphe Trieste 35,800 feet down to the bottom of the Marianas Trench. They spent 30 minutes on the bottom of the world before surfacing with their glass viewing ports cracked by the pressure. No one has been back since. And should they? 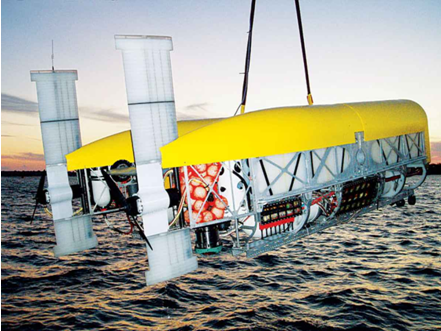 Theres a heated debate among oceanographers over whether the next generation of deep exploration should be performed by robots, humans or both. The argument for remotely operated vehicles (ROVs) is led by oceanographer Robert Ballard, who gained fame in manned subs, discovering the first hydrothermal vents and exploring the wreck of the Titanic. His case is simple: With no power-sucking life-support systems, ROVs offer more time on the ocean floor—and therefore, more opportunity to explore what we dont know—than manned subs. The robots send high-definition images and video to a ship by fiber-optic cable. The ship then sends the data via high-speed fiber-optic lines to a series of command centers, where oceanographers can analyze results in real time. "Im interested in bottom time, not the spiritual experience of diving," Ballard says. Others argue that collecting samples from the seafloor is easier when a person is in the pilots seat, and that no machine can replicate the panoramic scope of human vision. In 2004, celebrated oceanographer Sylvia Earle was in a sub 1,400 feet deep off the Florida Keys when, out of the corner of her eye, she spotted a six-foot mola mola, an ocean sunfish previously thought to live only near the surface. Earle is the most prominent of many advocates for manned research, and she boils her case down to a neat metaphor: "Would you send a robot to taste wine in Paris?" These vehicles all function in a similar manner. A support ship drops the vessel overboard. Anchored with weights, the sub begins to sink. To do some exploring in the middle depths, the pilot cuts some of the weight and the vehicle hovers, pumping water in or out to achieve a weight equal to that of the surrounding sea. Battery-powered motors propel the craft laterally for a short time, the ballast system takes on more water, and the craft sinks to the bottom. After scientists explore the seafloor and pick up samples with robotic arms, the pilot cuts the remaining anchors, and the sub surfaces. This elevator-like model works, but because the vehicles house people, electronics and motors within pressure-resistant, spherical titanium hulls, theyre heavy—Alvin weighs about 36,000 pounds—and require enormous support ships. And because of the limitations of battery technology, traditional submersibles dont give scientists much time on the seafloor; the Alvins current floor time is four hours. As a result, manned deep-sea exploration is incredibly inefficient. Imagine exploring all of Africa with only five Jeeps. The story continues on the next page, followed by a closer look at Alvin and Deep Flight II. The Nereus became only the third craft ever to reach the bottom of Marianas Trench. But new technology is changing the way designers look at submersibles. In 2008, engineers at Woods Hole announced plans for a $21-million renovation of the Alvin that would upgrade the viewing sphere and sample-collecting systems, allow for more maneuverability, and enable the vehicle to travel to 21,000 feet (the Alvin now maxes out at 14,760 feet). In addition to a new titanium alloy that can withstand greater pressure yet weighs less [see "The Science Sub," facing page], the key to the renovation is rapidly evolving lithium-ion battery technology. Lithium-ion will give Woods Hole engineers a battery thats lighter than the current lead-acid version and capable of delivering twice as much power, which would mean more time spent moving laterally in the water and powering instruments on the seafloor. Because of a funding shortage, renovation is scheduled to happen in two stages. (Oceanographers like to point out that NASAs budget this year is $17.6 billion, while the National Science Foundation, which doles out money to Woods Hole, has been allotted only $330 million for ocean research.) The first stage, an upgrade of the battery and the personnel sphere, should be completed by 2011. But the Alvin wont increase its maximum depth until the second stage, optimistically scheduled for 2015. Then theres Graham Hawkes, the founder of Hawkes Ocean Technologies, a company that designs aircraft-like submersibles. The English-born engineer (and Earles ex-husband) sums up the situation a little more brashly. "In a couple of centuries theyll finally realize that this is an ocean planet, and there will be a great era of ocean exploration," he says. "Theyre going to build a great craft, go down to the seafloor, and theyll find a little plaque. It will say, Hawkes was here. " Hawkess goal is to open the deep seas to anyone able to pay a few million dollars for a small sub. His model, both in a business and engineering sense, is the private jet. His submersible designs have fixed wings and sleek, elongated fuselages, like those on an aircraft. The pilot sits in a small, pressure-resistant hull. Everything else, including the motors, electronics and the lightweight foam that buoys the vehicle, is housed outside the hulls in the fuselages, saving weight. The sub is positively buoyant—lighter than the water it travels through. Its wings are inverted, and electric thrusters keep the craft from floating to the surface. Just as an airplane needs upward thrust to lift off, Hawkess subs use downward thrust to descend. Hawkes recently completed a shallow-water submersible, the 4,000-pound Super Falcon (price tag: $1.5 million), which can reach 1,000 feet and uses the flying-craft design. But building a lightweight deep-sea sub is a much bigger challenge. Hawkes says he has solved this problem with tough ceramic-metal composites and a pressure-resistant lithium-ion battery system. Four years ago, he started building a deep-sea vehicle, the 8,000-pound Challenger, for adventurer Steve Fossett, who planned to dive to the bottom of the Marianas Trench. During pressure tests at Penn State Universitys Applied Research Lab, the vehicles glass viewing sphere cracked as a result of what Hawkes calls a manufacturing flaw with a machined titanium part adjacent to the sphere. After Fossetts death in a private-plane crash in 2007, Hawkes stopped working on the Challenger (Fossetts widow now owns the original machine) and turned his attention to the Super Falcon. With that vehicle now on the market, Hawkess goal is to apply what he learned on the Challenger project to create a new commercial sub, called Deep Flight II, that will move freely through the ocean at any depth. The Challenger used a drop-weight system similar to the Alvins to assist its descent. Deep Flight II will ideally replace the weights with a stronger lithium-polymer battery, so its thrusters can propel it down, making it more nimble in the water. Even if Hawkes builds his vehicles in the next two years, as he hopes to, such crafts would probably be too small to haul a lot of scientific instruments. The Alvin is clunky, but it can carry many video cameras and monitors in its viewing hull. The negligible "trunk space" on his vehicles contributes to the idea aired in some scientific circles that Hawkes makes stunt subs. Hawkes says those criticisms are based on outdated notions. Instruments like cameras are becoming smaller and more efficient, he points out, and Deep Flight II subs will have robotic arms. Whatever criticism it receives, a craft like Hawkess would be a huge boon to marine biologists, who are restricted to using vehicles like Alvin for mostly immobile observation. Deep Flight II would allow scientists to rove freely. "Alvin is a wonderful vehicle for exploring the deep seafloor," says Bruce Robison, a marine biologist at the Monterey Bay Aquarium Research Institute in California, "but it cant work effectively in that middle depth where most of the animals are. We havent had many vehicles capable of working as freely in the ocean as the animals that live there." Ultimately, theres room for a mix of government-sponsored research vessels and private explorers in craft like Hawkess charting new underwater territory. After all, theres a lot of area to cover. "The oceans make up two thirds of the planet, and theyre unexplored," Hawkes says. "We want to find out what we dont know." Click onward for a closer look at Alvin and Deep Flight II. And be sure to tune in to Planet Greens Blue August all month for more on exploring and protecting our vast ocean frontier. Size:24 ft. long, 9 ft wide, 12 ft. high (est.) Weight: 20 Tons Operating Time:10.5 hrs. Crew:1 pilot, 2 researchers Max Depth: 21,000 ft. (by 2015) Vertical Speed: 157 ft./min. Lights: Ten bundles of LED lights will illuminate the deep five times as efficiently as the previous bulbs and last four times as long—five years or more. Each lamp can be precisely controlled to provide even, focused light for the researchers and high-definition cameras. Body: The body is kept afloat by a material called syntactic foam, which consists of billions of tiny air-filled glass spheres embedded in an epoxy resin, like hardened Styrofoam. Syntactic foam has been used in oil rigs and diving equipment, but Alvin will employ a new version that combines two different sizes of glass spheres, which means they fit together more closely, for an unprecedented strength-to-weight ratio. Thrusters: Six electric thrusters let the craft move in any direction. The typical range is only a few hundred yards, but if theres nothing else being powered by the batteries, Alvin could travel up to two miles. Robotic Arms: The new Alvin gets a more powerful and agile set of robotic arms, and its basket can carry up to 400 pounds of equipment or samples to and from the surface. Its tool arsenal includes sensors for measuring thermal vents and coring devices for sampling sediments. Sphere: Forged from a strong yet lightweight titanium alloy, the seven-foot-diameter crew sphere is machined with exacting precision. Discrepancies of even 1/50 of an inch from a perfect sphere could cause a structural collapse under the intense pressure of the deep ocean. Viewports: Five viewports—two more than the current sub and, at more than a foot across, several inches larger—let researchers view wider swaths of the deep through nearly four inches of Plexiglas. The new array lets the pilot look left and right from the drivers seat without getting up. Ballast: Steel weights carry Alvin toward the bottom. A ballast system adjusts buoyancy once it reaches the bottom and unloads some of its equipment, releasing air from fiberglass tanks to help it stay down.To ascend, the pilot just releases the steel weights. Batteries: The biggest upgrade is a cadre of lithium-ion batteries, which provide twice the power at half the weight of the old lead-acid batteries. They will enable dives of more than 10 hours (five hours longer than todays Alvin) and a top speed of three knots, up from the current two. Batteries: Hawkes is using the latest lithium-ion batteries, known as lithium-polymer. Their housing is pressurized to help with buoyancy. Body Materials: Developed by the U.S. Navy and refined by Hawkess team, the composite ceramics of the body tout a higher strength-to-weight ratio than titanium. The body surrounds the pressurized hull and other equipment, like the battery cells. Cockpit: The pilot, strapped in stomach-down, can steer the craft using a joystick to control the wings. The prone position mirrors the natural posture of divers and fish and puts the pilots eyes as close as possible to the viewport and the robotic arms. It also minimizes the size of the pressurized chamber, which reduces the crafts weight to just 5,000 pounds. Thrusters: In a "work" configuration, four pairs of lateral and hovering electric thrusters—five-bladed propellers—allow for careful maneuvers near the seafloor, stabilizing the craft within fractions of an inch for hovering against cliff faces. Configured for sight-seeing, two high-speed thrusters propel the sub forward at 600 feet per minute. Wings: Two stubby wings allow the sub to "fly" underwater in any direction. Rather than slowly sinking or rising like a blimp, the craft uses water running past its wings to create reverse lift— the opposite of the force on an airplanes wings—and moves up or down depending on the position of the flaps. It can dive 400 feet per minute, four times as fast as current subs. Lights and Camera: Wing- and nose-mounted LED lamps let the pilot and the onboard high-definition cameras see 40 feet into the inky black. Lasers probe the water for obstacles ahead, while low-intensity sonar scans the water for creatures so the pilot can quickly turn on the lights and snap a photo before the animal darts away. Hull: A cylindrical compartment needs to be twice as strong as a spherical one because of the way the pressure is distributed over the surface of the pressurized hull. Hawkes is using a special kind of carbon composite, originally developed for aerospace applications like rocket nozzles, that better resists compression than standard carbon fiber, which is best at resisting tearing. Traditionally, carbon fiber is made with an interwoven pattern that makes for weak spots where the fibers overlap. To make the new material, a computer lays each braided, hair-size fiber alongside the next. The carbon composite is lighter than titanium, which aids buoyancy.